Elliott Bay Animal Hospital with 7 Vets located in Seattle, WA: AAHA-accredited, Board Certified doctors & hospital provide the finest care for your pet. Elliott Bay Animal Hospital, established in 1945, is conveniently located between the Queen Anne and Magnolia neighborhoods. We are a full-service hospital providing veterinary care to dogs and cats. 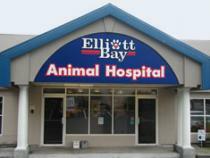 Elliott Bay Animal Hospital provides a full-service boarding facility. While boarding, your pet benefits from the on-site supervision of our skilled veterinarians in monitoring your pet's health and well-being in your absence. Our friendly and professional team members strive to provide the highest quality veterinary care, emphasizing exceptional client service and patient care.